Christmas is such a magical time. All the lights, treats, and music just add to the ambiance. 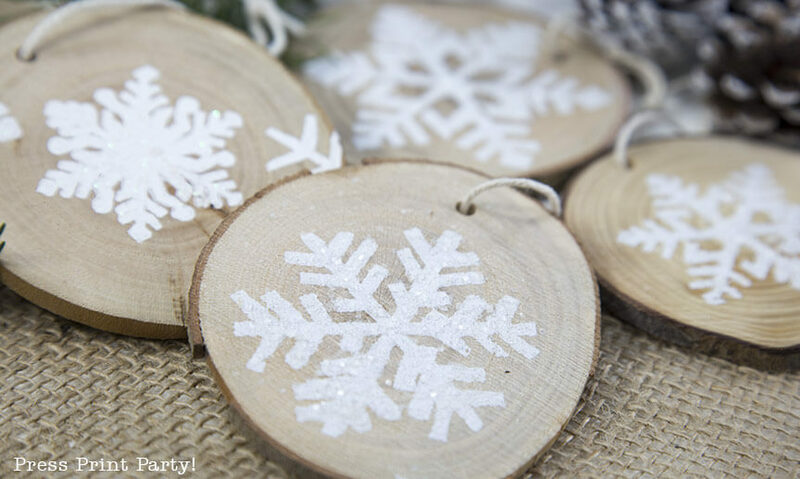 Are you intimidated by the thought of creating a Christmas table? It’s not as tough, or expensive as you might think! 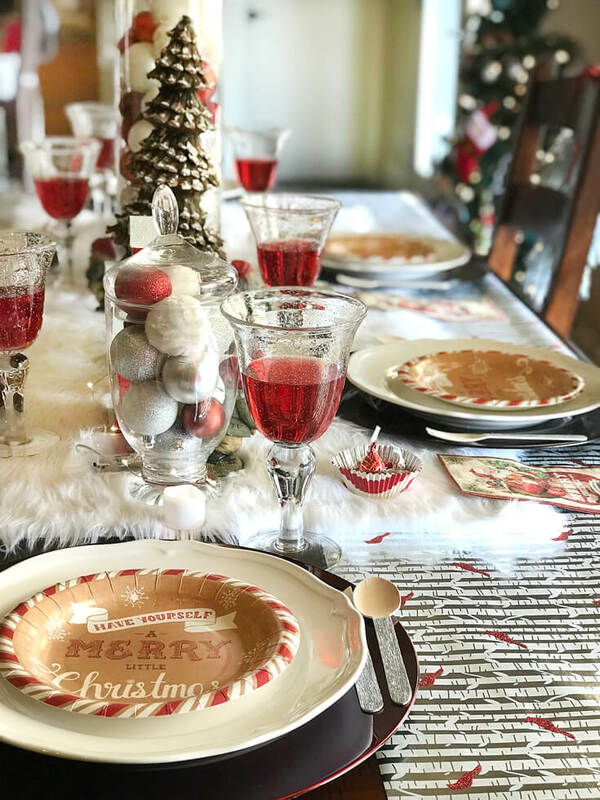 I wasn’t planning on styling a Christmas table this year but setting up the centerpieces made me realize I had everything necessary to transform our dining table into a Cozy Cottage Christmas Tablescape! I’ll take you through how you can create a simple, yet stunning, tablescape of your very own in just a minute. 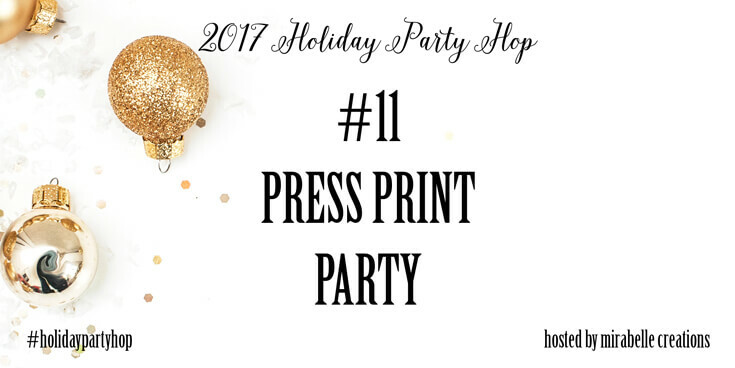 First I’d like to welcome you to the 2017 Holiday Party Hop! 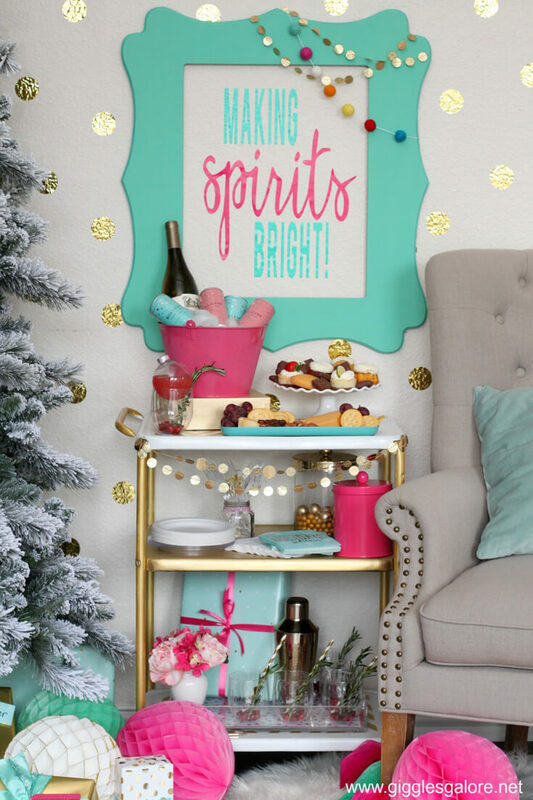 I’m thrilled to be joining 17 other event stylists and party shops to bring you a host of fabulous holiday inspiration. Cause you can NEVER get enough! If you’re just joining the tour you can start at the beginning with our lovely hostess, Mirabelle Creations, and work your way through. I promise you won’t regret it! For the table cover, I cut a piece of gift wrap in half and lined each side of the table. Gift wrap is inexpensive, comes in so many colors and styles, and you can recycle it at the end of the season without an ounce of guilt. 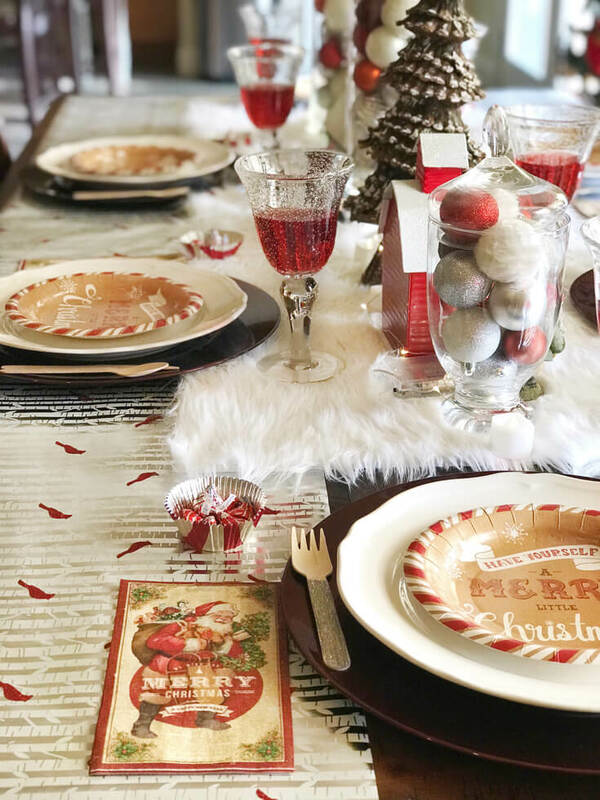 I found this beautiful white and silver birch tree pattern with red glitter cardinals in Target’s holiday section but you’ve got to start shopping EARLY to find the really great designs. I often use wrapping paper for runners but this year wanted to try something a little different and layered a piece of white faux fur from Fabric.com on top. *Pro tip: When cutting faux fur you want to cut from the back side to avoid snipping the fur and making a huge mess! You can use an Exacto knife and straight edge to cut softly through the backing for the cleanest cut. After cutting, run it through the dryer on low heat with a damp cloth to remove any stray hairs. The easiest centerpiece around is a vase filled with ornaments in your particular color scheme. 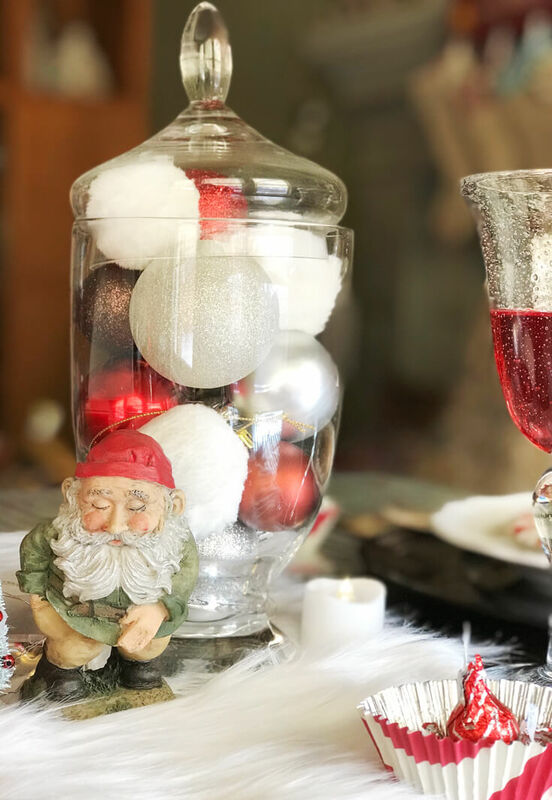 I chose silver, white, and red balls to compliment the gift wrap and filled a medium hurricane vase, a tall straight apothecary vase, and a small curved apothecary vase with a lid. Because they are all clear glass they work together. Collecting complimentary but not matching vases from second hand shops or clearance sales is great on the budget. In between the glass vases add something with color or texture. 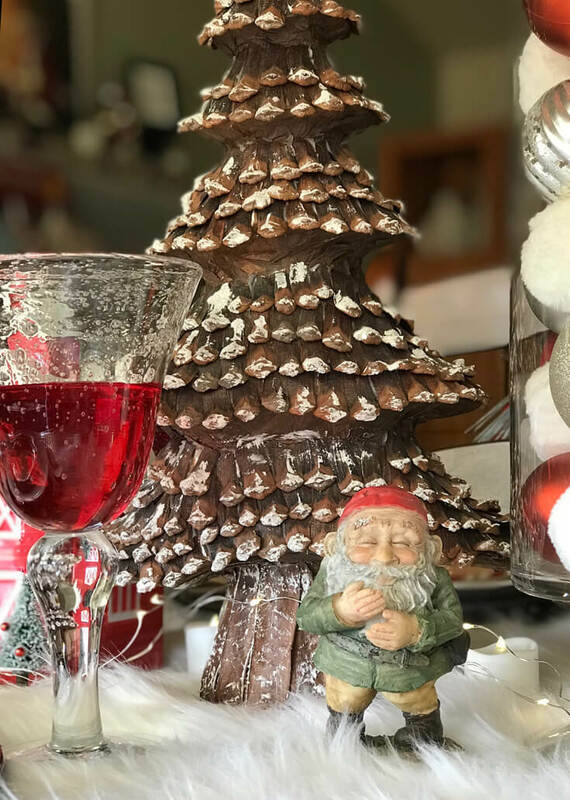 These pinecone trees were the perfect touch. I picked up two different sizes from Michaels Christmas display on clearance last season but you won’t have to wait since they are having amazing holiday flash sales right NOW, every day til Christmas. 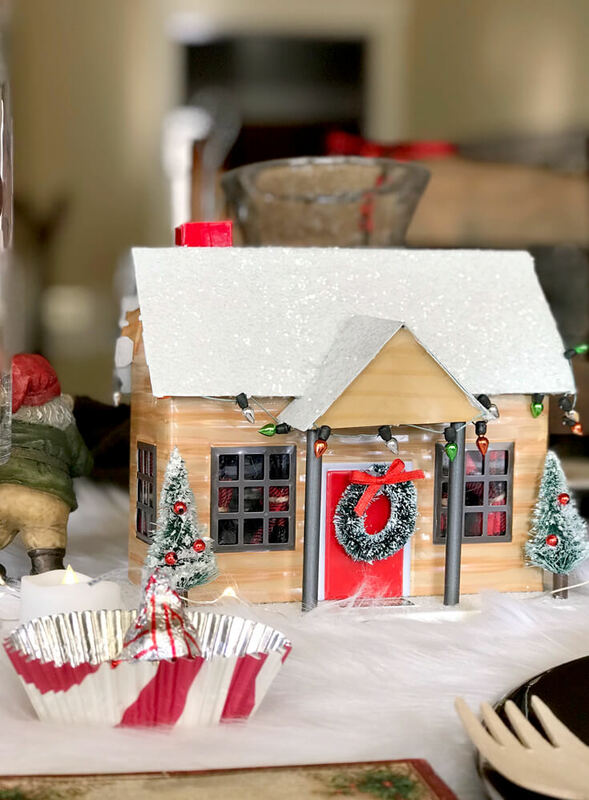 Now this little Christmas Cottage from Target was totally unnecessary but adds so much charm! I love the vintage look it brings. And the red barn! A companion piece to the cottage also from Target. I love the glitter roofs on both these pieces that tie in the gift wrap, utensils, and glitter ornaments. Plates: A classic set of white dishes will be the most versatile thing you own. 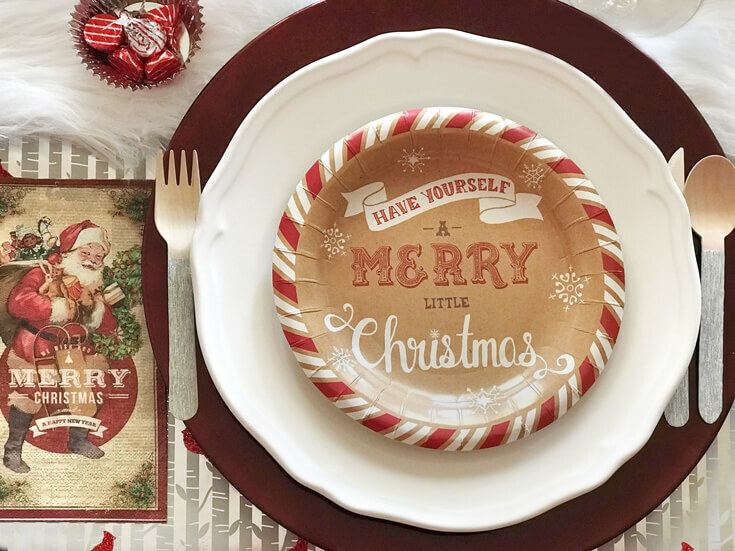 Layer the white with a fun colored salad plate, as shown here with a vintage paper plate found at Home Goods. Napkins: Go fancy with cloth or more low key with paper. 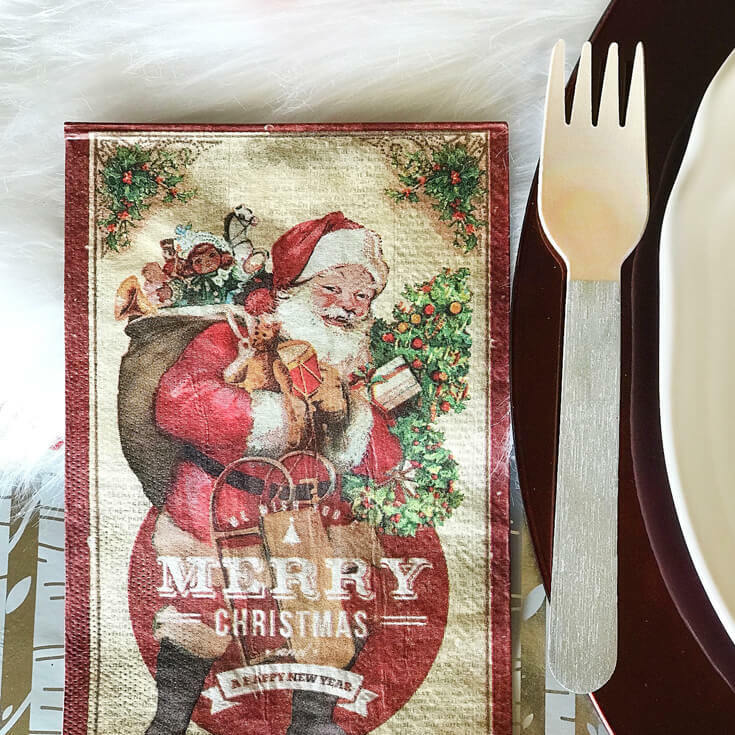 Fold them into amazing shapes, tuck them in between charger and plate, or simply set on the table to showcase a darling vintage santa! Also found at Home Goods, but you’ll never see the same thing twice so if you find paper goods perfect for the holidays, I give you permission to GET THEM! Cutlery: Polish the silver, break out the faux metal cutlery, or my personal favorite right now, these wooden utensils from Amazon! I even added a little sparkle with silver Washi tape! Glasses: The final necessary item is a drinking vessel. These clear bubble or “seeded” glass goblets are my absolute FAVORITE because they go with everything. 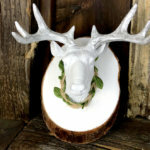 You can add a sugar rim, decorative charm, or themed stir stick to dress up any glass. How cute are these little mischievous Gnomes? This set came with my husband as a keepsake from his childhood. 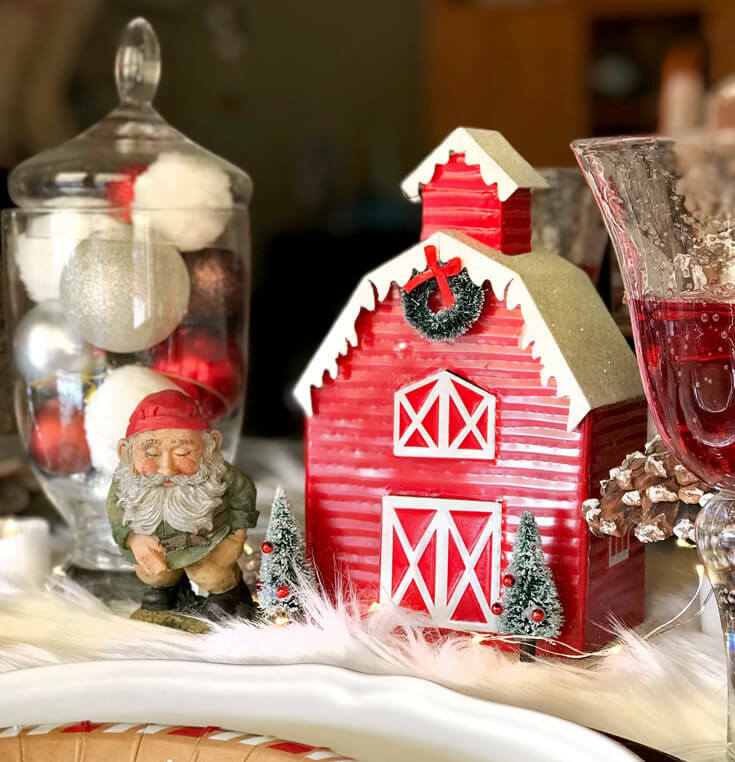 I love mixing vintage pieces with nostalgic reproductions for a classic cottage Christmas tablescape. Just tuck these little guys in between your vases and fillers. As a finishing touch, sprinkle candles down the center in and around the decor. These LED battery operated tea lights have a built in timer which allows you to turn them on once. They come on the same time each evening for 6 hours and then automatically turn off. It’s magical! Place cards and favors are the final touch to a place setting. There are a million and one different ways to do this. 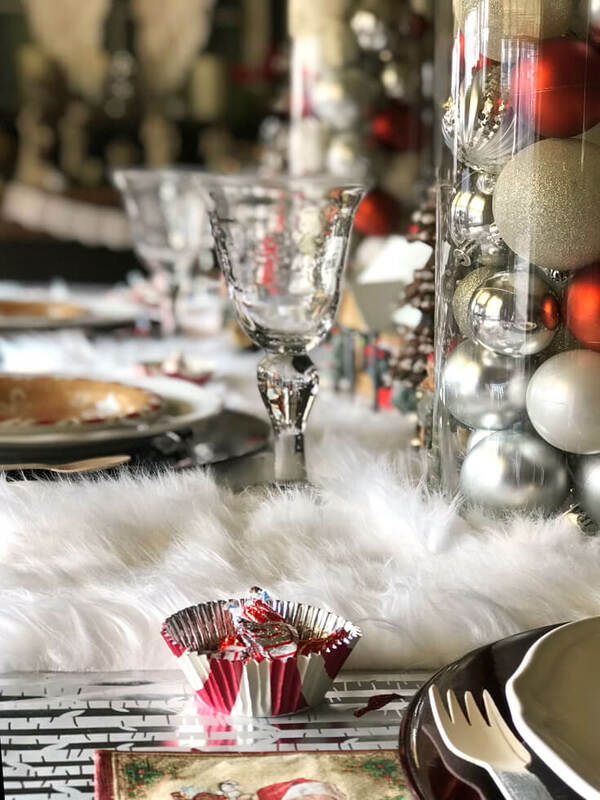 I opted not to do a place card since it’s just my little family for Christmas dinner this year but I know my kids will appreciate the cupcake liner of Hershey’s Hugs while they wait for dinner to be served! Chair backs are something I always want to do but usually don’t get around to. Give yourself a break and purchase greenery sprays like these. All I did was add the ribbon. Sprays make it easy as you simply fold the wired stem to create a hook and drape it over the top rail of your chair. To avoid scratches use coordinating ribbon to wrap a section of the top rail. 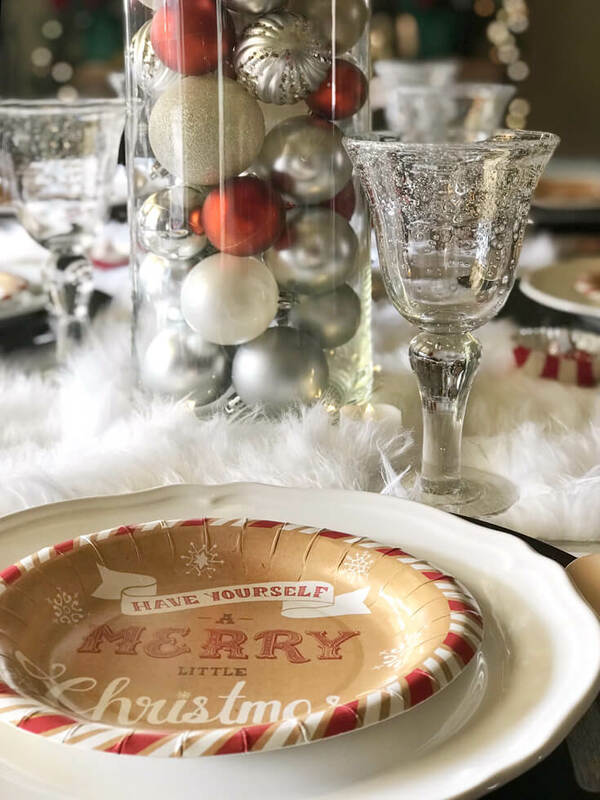 A simple and elegant final piece to our cozy cottage Christmas tablescape. I hope you enjoyed the tour and feel empowered to tackle your own Christmas table! 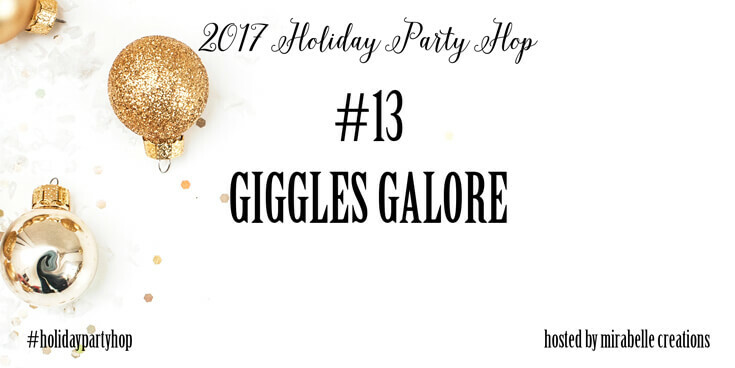 Keep the party rolling by heading on over to Giggles Galore and see Mariah’s darling holiday bar cart up next on the Holiday Party Hop. I’m so glad you stopped in and wish you a very merry Christmas! 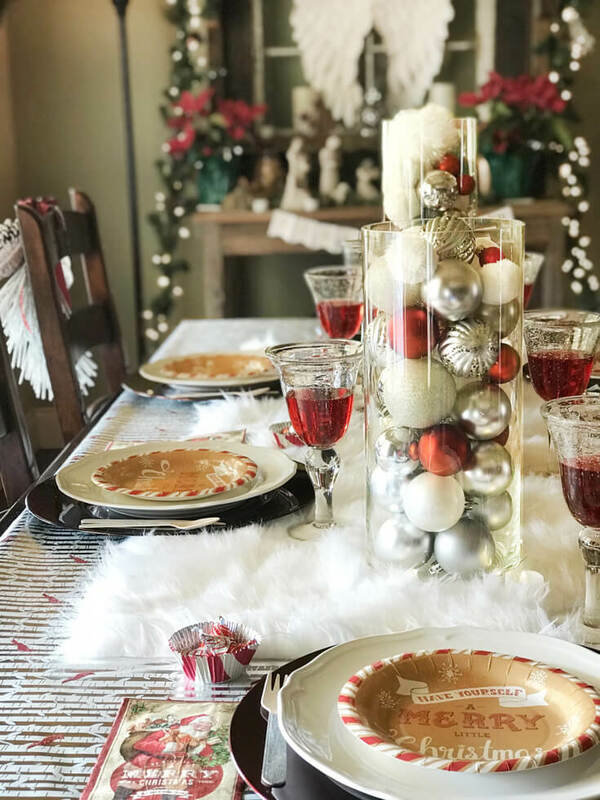 Understand the elements necessary for fabulous table decor by deconstructing a Cozy Cottage Christmas Tablescape. 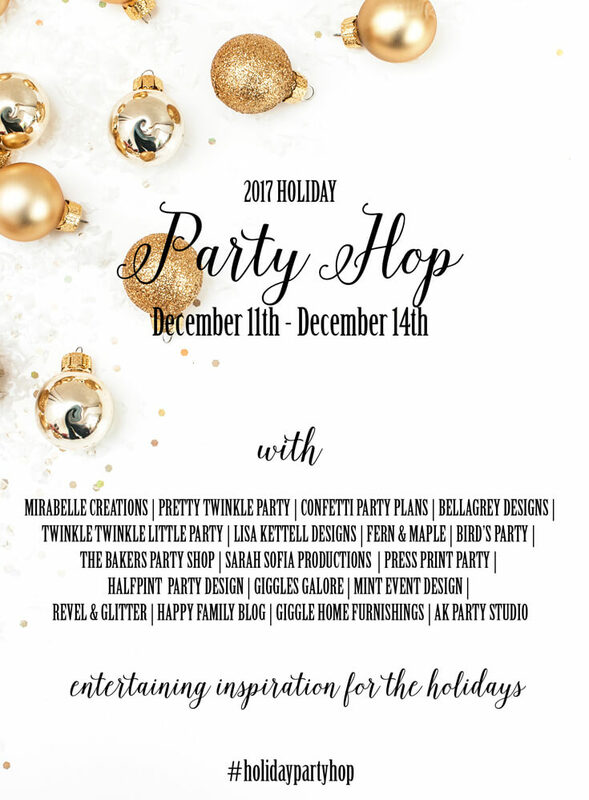 Stop #12 on the 2017 Holiday Party Hop hosted by Mirabelle Designs. Thank you so much! This one came together easily mostly with things I already had! Love it when that happens!! So fun to be in another hop with you and the other talented ladies!! I love this beautiful party. I especially love those chair swags, they are the perfect touch! Thank you Mariah! They were the last thing I did and I don’t think it would have been “finished” without them. I love the use of wrapping paper as a runner! So clever! Thank you! I’m obsessed with wrapping paper lately. Must have something to do with my new found love of Spoonflower. But it’s so versatile and such an inexpensive way to easily add color and texture. 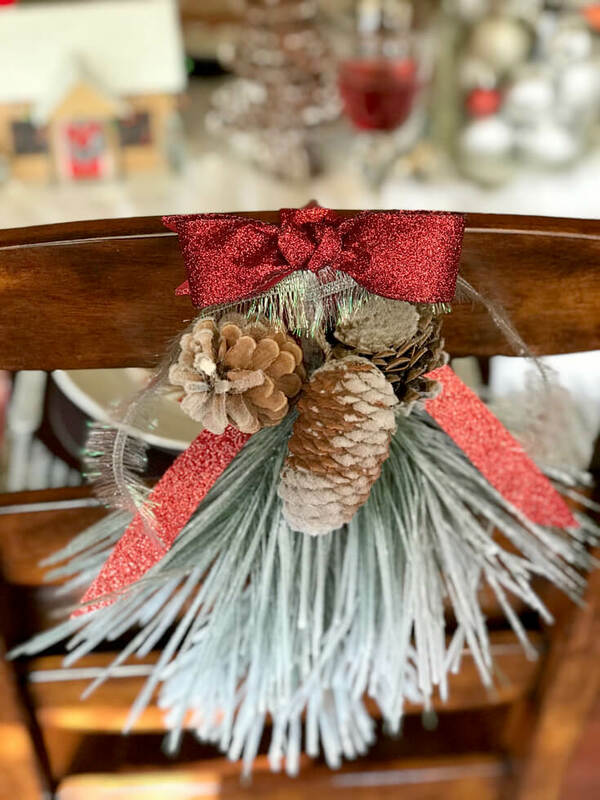 Love all the different elements – the pine on the chairs, the bows, the fur & the wood! So beautifu and cozy! Thank you so much Deanna! It was fun to bring it all together. I was shooting for cozy so I’m glad you think I achieved it! The chair backs were SO easy! Just use the greenery picks and fold the wire down. Makes a handy little hook that fits right over the top rail of the chair. I just added a bow and some ribbon. And the centerpieces are so easy it feels like cheating but I really do like how they look all together. Thank you so much for hopping in! Oh my goodness you created such a stunning table!! I’m so fond of the cozy touches especially the fur!! Thank you Lori! The fur was one of those things I decided on long ago. I had some extra hanging around that needed some love. I think it’s a pretty fun way to use it. Absolutely stunning! I am truly inspired. Love the fur on the table. It really sets everything else off. The fur was a fun one. We’ll see how it fares after a meal! But it’s washable so it should be ok. I had some left over from another project and knew it needed to be on my table this year. Thank you so much for stopping. Glad you enjoyed it. I AM a big fan of parties and we do try to have a lot of fun. Thank you so much! This table inspires me every day. Those gnomes are from my husbands childhood. I didn’t appreciate them fully until recently. Very pretty and festive! I love all those colors together and how bright it looks. I do love the white, silver, and red combination. Makes the red stand out even more. Thank you so much for hopping! I’m so glad that you enjoyed it. Bri – this whole table is amazing! Adding in the little house and barn really makes it! 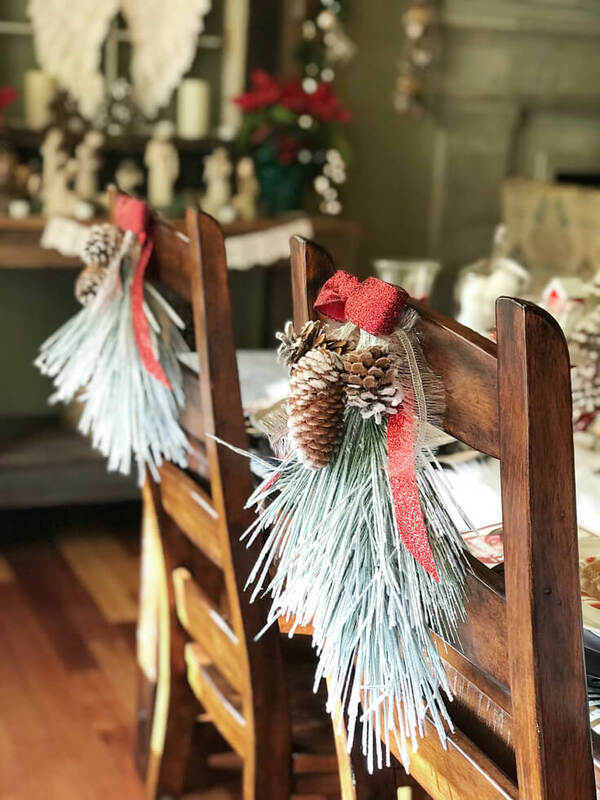 It all looks so festive and inviting….but I love the chair backs with the greenery picks. I have never seen that before, and I think I need to try it ! Thank you for some great ideas and inspiration! Thank you so much! It was my first time trying the picks too and it was SOOO easy. I don’t think I’ll use anything else now! The house and barn were last minute additions and I’m so glad I did. So happy you stopped in. Merry Christmas! Bri, this is so inspiring!! All the decor looks amazing and totally feels so cozy!! Thank you Carolina! These hops with everyone have been so much fun. So glad you like my little table. It would look really nice with your photobooth…..we might need to collab someday! Thank you Andressa! You’ve been such an inspiration to me. This hop has been amazing. The chair swags are too pretty! Love it all!! Thank you Jennifer! They were a last minute addition and I’m so glad I did. This is a fun and cozy table for the family. So warm and inviting. Exactly what Christmas should be. I’m now in the Spirit with these photos. I LOVED your Christmas decor too. It’s fun to break it up with fun and whimsy like you did but I really needed the stability of traditional this year! Something about makes me feel like I’m getting a hug. Thank you so much! Thank you so much sweetie. This was a really relaxing one to do. I wasn’t planning on showing it off. This one was just for me so it took the pressure off and made it really fun. Your post is so full of inspiration! 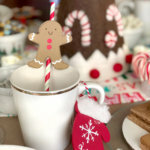 Can’t wait to print out the list of table elements and use it as a guide to my holiday tablescape! I’m not sure you need my list! But it’s a great recipe to follow for beginners or those that aren’t feeling confident in their decor abilities. Thank you so much for stopping! Looking forward to getting to know you.